PARIS (CNS) — As Europe continues to struggle with migrant and refugee arrivals, Catholics in the French capital are heeding Pope Francis’ call to come to their aid by providing practical and spiritual help to the newcomers. A key figure coordinating Catholic aid is Jerome Perrin, president of the Society of St. Vincent de Paul in Paris and a member of St. Rosalie Parish, located in a Left Bank neighborhood’s south of the Seine River. “As a young student, I gave French courses to immigrants and learned how to assist them. At the time, it was the Algerians,” Perrin, 63, told Catholic News Service in a parish office adorned with a photo of Pope Francis. Fast forward four decades to 2015, when a massive influx of refugees from Syria and elsewhere made the dangerous journey to Europe, riveting the world’s attention. It was the call of Pope Francis and retired Paris Cardinal Andre Vingt-Trois to respond to the newcomers in need that pushed Perrin and other Catholics into action. Perrin discussed the situation with St. Rosalie staff, established a communication system to contact refugees, and began a refugee association. Nearby parishes joined the effort. “For me, that means in the spirit of the Society of St. Vincent de Paul, carrying the message to those near at hand and in solidarity,” said Perrin, a vice president at automobile manufacturer Renault and the holder of a doctorate in physics and bachelor’s degree in Catholic canonical theology. Perrin first focused on accommodations for refugees. In Paris, finding housing is a challenge, even for Parisians, but he was able to locate a hotel for Syrian and Iraqi refugees. “Then I found a place called La Mie de Pain (breadcrumbs),” he said. 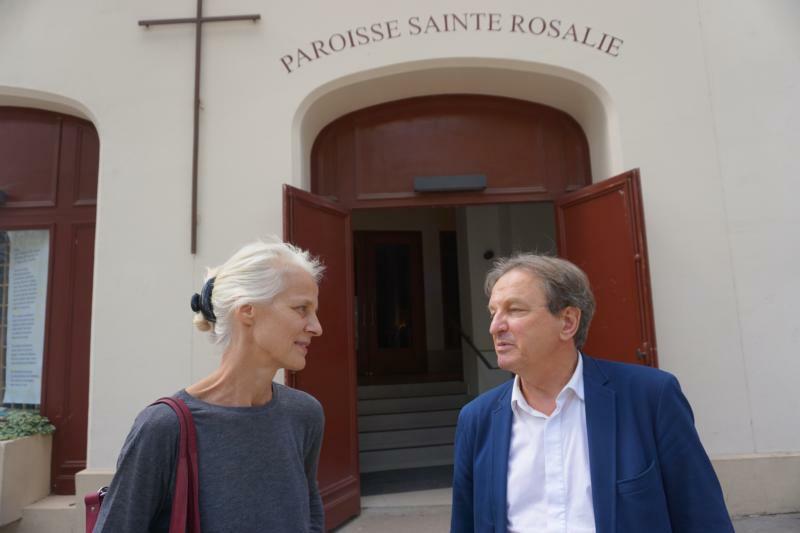 Not far from St. Rosalie Church, the modern complex mainly housed homeless men.The refuge had been welcoming migrants seeking asylum since June 2015 and Perrin helped connect the parish with its managers to organize French courses, outdoor activities and lodging solutions. A lawyer was recruited to handle legal issues. A program was introduced so refugees could learn French and the local culture through monthly outings and special meals to encourage relationship-building between the Parisians and the newcomers. Integration for the refugees and migrants into French society is a significant challenge. “Another young Sudanese picked up French quickly, in six months, found a place to live and work as well. A success story, we would say. But he told me, ‘It’s tough. I feel alone. My neighbors don’t know me and with other Sudanese, relationships tend to fall along tribal lines and don’t guarantee friendship,'” Perrin said of the young man. St. Rosalie is providing housing for a Syrian family and is helping two other families from the war-torn country. One of the refugees is George, a Catholic from Aleppo. He asked that his real name not be used out of fear for reprisals to relatives in his homeland. George, who eventually hopes to be cleared for work by French authorities, credited Perrin with finding his family a place to live and being a source of continual hope for refugees. Perrin only credits God and the Holy Spirit for some of the miraculous interventions. Ever the networker, Perrin said he has a portfolio of associations and organizations providing specialized aid to migrants and refugees. “It’s important to link people together, rather than for individuals to provide help solely on their own,” he said. In the north of Paris, Father Kokoli-Ce Herve Loua of St. Denis de la Chapelle Parish hosts a weekly Saturday breakfast with parishioners and migrants and refugees from the nearby Porte de la Chapelle area where many live. The two parishes maintain informal working relationships. “It’s very diverse. There are a lot of Sudanese, Eritreans but also people from West Africa, including Ivory Coast, Mali, and Guinea,” the young priest, who hails from Guinea, told CNS during a breakfast gathering. “We have breakfast together, people can also recharge their cellphones and do a small French course. Everyone is welcome who needs a smile, a small word of encouragement,” the priest said. “We also pray with people. We tell them the Good News, we celebrate and we serve” the mainly Muslim migrants, Father Loua said. Paris Archbishop Michel Aupetit has highlighted migration and the importance of serving refugees since he was installed in January, Perrin said. “A huge meeting with the archbishop and about 400 people from all the parishes working with refugees took place just days following his (installation),” Perrin said.